Deck Waterproofing Terminology, like all professions, has its own terms and words to describe what waterproofing is and does. It applies to applications, tools and processes that occur to and during waterproofing. It becomes a language of its own and gaining knowledge of the terms helps to understand what waterproofing truly means. Like other languages, argument begins to develop over the terms bringing changes to the meanings of term and, therefore, understanding. Though not in alphabetical order, the word waterproof is under attack. Since it can mean different thing to different people, another term has reached acceptance among the construction grammarians. Protective systems is now the preferred term. Either way, it refers to the various degrees of protection that work against water and other contaminants used by generically defined systems. Many are silicon based because the elastic nature of the material and its porosity allow the substrate to breathe and retain its character. Adhesion and Adhesion Strength: Both of these words are interrelated. Both reference the bonding to a substrate during stress or movement. The first applies to waterproof material and the second to sealants. Air-gap membrane: A dimpled membrane of high density polyethylene. Impermeable to water or water vapor, a space is formed between the membrane and a foundation wall. The space is filled with air allowing the water to travel toward the weeping tile. A capillary break is also formed between the foundation wall and any nearby saturated soil. Capillary break (Wicking): Is a barrier to the transition of moisture through small interconnected pores in concrete. Abetted by adhesion and surface tension, the moisture travels through the pores, but is stopped by the capillary break. Coating: There are various kinds and each provides a specific purpose. Often the composition of the coating is related to its intended use. Moisture, water proofing etc. Unfibered foundation coatings are generally applied to deter moisture. Damp Proofing: This refers to moisture control and includes damp proof course which specifically refers to water rising up (rising damp). 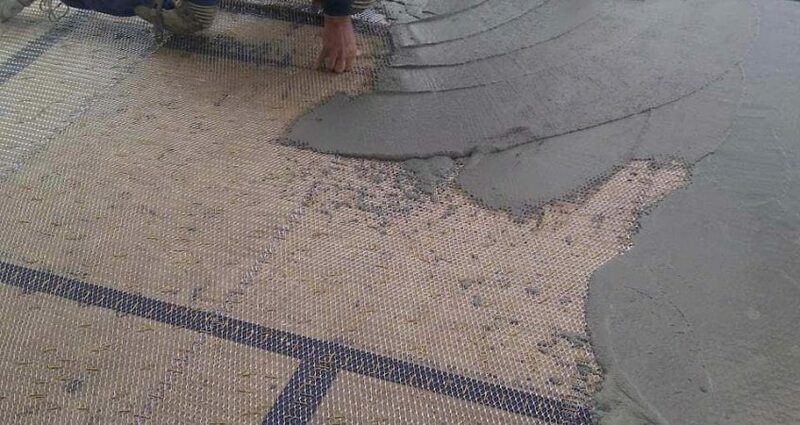 The term also reference the application applied to a substrate to prevent moisture seeping from water or from the ground. Efflorescence: A residue of salts remaining on a surface. Occurs during leaching of salt solutions from masonry, concrete etc. When it dries, the whitish salt substance appears. Epoxy injection: This is simply injecting epoxy adhesives into the cracks to fill them. The epoxy gun is used to inject the epoxy. Evaporative moisture cooling: Moisture evaporating from material has a cooling effect upon other material that is damp or wet. Grinders: Electric tool that grinds a cement surface readying it for repair etc. Hydrostatic pressure: The exertion of force on an underground structure by the water that surrounds it. Monolithic Membrane: Refined asphalts and synthetic rubber make up these types of membranes. Used on many applications for waterproofing, it is becoming popular for the simplicity of its application. Radon Mitigation Kits: A kit that is used to determine levels of radon and materials to reduce its effects to acceptable amounts. Rebar tying tool: Rebar provides strength to cement. It’s a thick metal bar that is tied to other rebar to make a structure to support cement. The tool ties rebar to rebar. Sealants: Usually epoxy that provide protection from various problems like radon, cement sealing and water. Seepage: The gradual movement (usually water or moisture) through a porous substance. Sill plate: Usually 2X4’s, a sill plate is the base member to which vertical members are attached (a wall) Often called a sole plate. Spalling: Refers to any disruption of the normal surface to concrete and its products. Chipping, splintering, cracking and even breaking into small pieces indicate spalling. Once water permeates a concrete surface and freezes, it will expand causing surface deterioration (spalling). Split-slab: This term refers to concrete. One slab serves as a slab on grade that is waterproofed with a drainage systems. This first slab can be suspended too. The second slab goes over the first completing the ‘split’ which defines this process. Vertical Waterproofing: The term suggests the definition. Usually referencing walls or vertical structures that base out to a floor or substrate. Several layers of membrane (bitumous) are layered in a prescribed manner first using a torch and then several layers of membrane with a primer. Water Repellant: Hydrophobic is not a term often said on the job, but that is what a water repellant is. It repels water – not necessarily completely. It also refers to the coating applied to a surface to prevent water from seeping into a substrate or surface. Water table: Refers to water underground that is saturated with water that creates water level. It often fills spaces, cracks and fissures occurring underground, including spaces in rocks. With such a rich list words that describe the many components and challenges to waterproofing, it is easy to understand why the field is so complicated. The list is not exhaustive, but gives a good general idea of many terms and the complexity of issues that challenge waterproofing applications. Contact us, Pli-Dek Systems, to learn more about deck waterproofing and you might encounter some of the many terms that are intrinsic to applying waterproofing to surfaces.